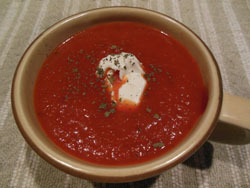 Have your blender ready because you want this Roasted Red Pepper Tomato Soup as smooth as possible. Using the blender will also bring all the wonderful flavors together. Steam celery and onion in micro wave till soft. Put in blender with tomatoes and puree till smooth. Pour into pot and add the rest of the ingredients. Heat to boil, reduce to simmer for about 15 minutes. Remove from heat and serve.